The CanDo® Upholstered Mat Table is a heavy duty, upholstered mat platform in natural wood tone. It features a plywood frame with 6 solid hardwood legs and a center support for added stability. The corner legs are triple-bolted, and the frame is attached with steel angle for extra durability. The topcoat finish is made of a heavyweight, knit-backed upholstery with 2-inch foam padding and seamless rounded corner top. The gray edge bumper guard helps protect the top from tears. It measures 84 x 48 x 18 inches and has a 700-pound weight capacity. 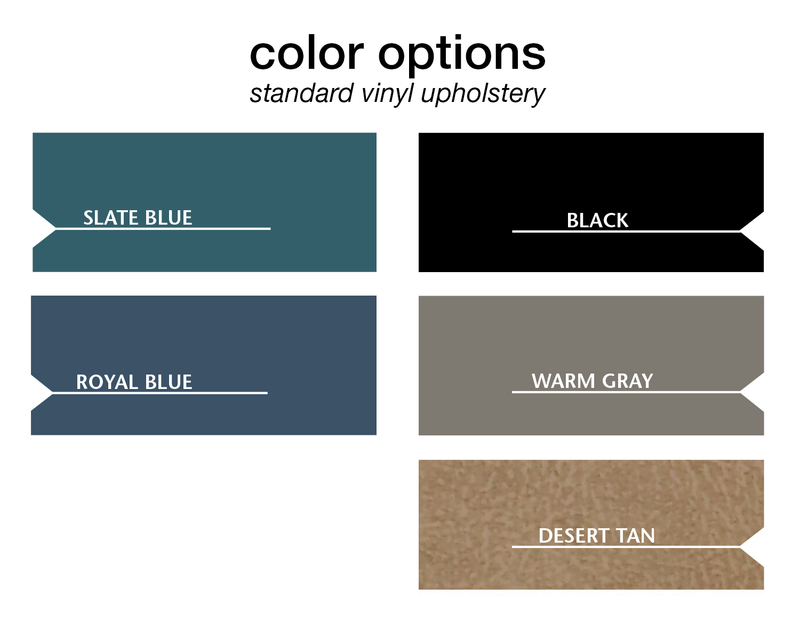 Comes in multiple colors upholstry colors. Default is slate black upholstry and natrual wood finish. Comes in multiple upholstery colors and a natural wood finish. Default is black upholstery. 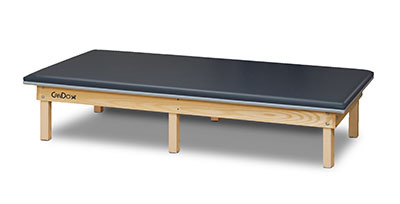 Dimensions: 84" x 18" x 48"
The CanDo® Upholstered Mat Table is a heavy duty, upholstered mat platform in natural wood tone. It features a plywood frame with 6 solid hardwood legs and a center support for added stability. The corner legs are triple-bolted, and the frame is attached with steel angle for extra durability. The topcoat finish is made of a heavyweight, knit-backed upholstery with 2-inch foam padding and seamless rounded corner top. The gray edge bumper guard helps protect the top from tears. It measures 84 x 60 x 18 inches and has a 700-pound weight capacity. Comes in multiple upholstery colors and a natural wood finish. Default is black upholstery. Dimensions: 84" x 18" x 60"
The CanDo® Upholstered Mat Table is a heavy duty, upholstered mat platform in natural wood tone. It features a plywood frame with 6 solid hardwood legs and a center support for added stability. The corner legs are triple-bolted, and the frame is attached with steel angle for extra durability. The topcoat finish is made of a heavyweight, knit-backed upholstery with 2-inch foam padding and seamless rounded corner top. The gray edge bumper guard helps protect the top from tears. It measures 96 x 72 x 18 inches and has a 700-pound weight capacity. Comes in multiple upholstery colors and a natural wood finish. Default is black upholstery. Dimensions: 96" x 18" x 72"